I decided to try all the most calorific desserts I knew since I was in NYC. Truth be told? I enjoyed every single bit of the indulgence 😉 All huge, not classy at all, but I kind of understand the craze over donuts, cookies and cheesecake there. Not the cupcakes though. I still don’t get that one haha. A classic made better with deliciously non-acidic bittersweet chocolate (i love the blend!). This is THE chocolate chip cookie to waste your calories on- a creation of Mr Chocolate himself, Jacque Torres (went to the one in the Rockefeller centre). It’s the crunchy kind with bittersweet chocolate swirled into the batter. No other textures involved, but I enjoyed it. Plus point, it was huge! 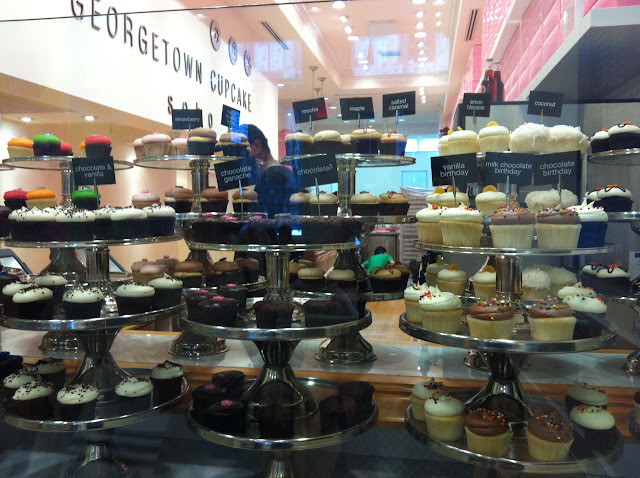 Georgetown cupcake was such a disappointment. The sugar-filled swirls of buttercream didn’t agree with my tastebuds at all. The only saving grace would be their fine-crumbed cake bases. Flavours? *yawn* They need to watch cupcake wars for some inspiration. Junior’s cheesecake (there’s one in the Grand Central Terminal) was SO SO delicious and more-ish. 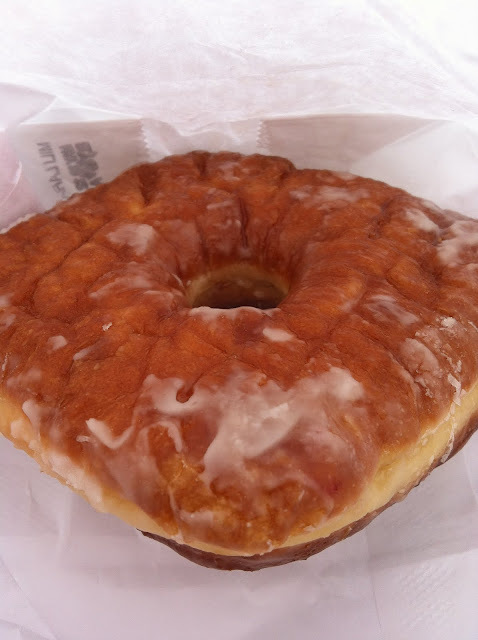 I know, the strawberry glaze looks a little… shocking but I would give it the status of comfort food. Smooth, creamy filling with a thick biscuit crust. It’s ginormous… but it’s strangely satisfying to take huge forkfuls and still see a lot of cake, haha. My jelly-filled donut from the Donut Plant. Bought it off Dean & Deluca cuz I didn’t have the time to visit the main outlet. A tad dry because of that but still, it’s soft, pillowy and there’s jelly inside! Plus how can I say no to a square donut? 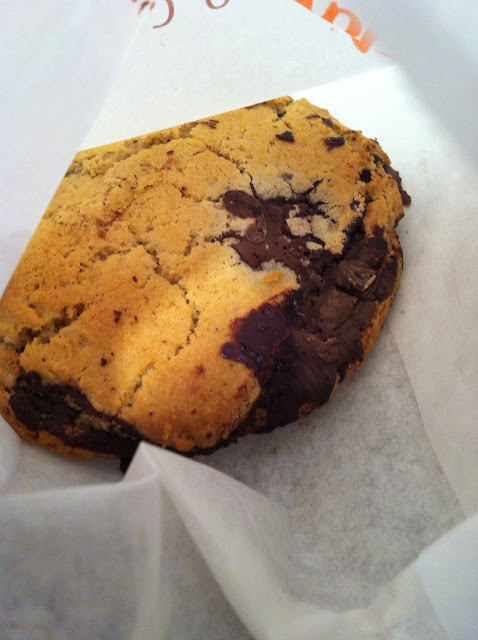 ahhh if only you had blogged about that chocolate chip cookie earlier! it looks so good! OMG, you really went all out with the sweets, didn’t u? Hahahaa! Good for u! yes I did, a little excessive I realise… for TWO days. But oh well! I love sugar. Off the top of my head, I would say in Boston go for the Freedom trail, visit schools like Harvard and MIT (don’t forget their museums! ), and I’m not sure if it’ll be showing when you’re there but Billy Elliot’s an awesome production that you should catch if possible! They sell discounted tickets at a stand in front of Quincey MArket… you might want to check it out beforehand cuz I can’t exactly remember where. Oh and if you are into art I recommend the Isabella Stuart Gardner museum. A little quirky but it’s beautiful. Please go on a guided tour to fully understand the place! For NY, you MUST catch a broadway production. There are tons of flagship stores which makes window shopping really fun haha. But of course you can also do real shopping at forever21 (I love the one at times square, it opens till really late in the night. I stayed in there till midnight once? not sure if it’s an everyday thing), A&F, american eagle and coach 😉 A trip to Liberty Island to see the statue of liberty is also worth it. apparently their museums are great too but I never got the chance to visit. heard the Guggenheim’s a good one.